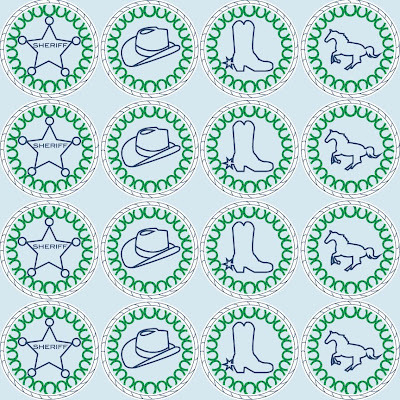 When I created a baby boy fabric for a Spoonflower contest in March, I went with a cowboy theme with a color palette of light blue, navy blue and kelly green. The design featured a sheriff's badge, a cowboy hat, cowboy boot (with a spur of course!) and a horse encircled with horseshoes and ropes. I loved the way it turned out and immediately wished I knew a baby boy who would love it at much as I did when I created it. Alas, I only knew baby girls who were far more princesses than cowgirls. My friend Whitney, who works for country artist Jewel, decided it would be the perfect gift for her new baby. It was fitting since Jewel's husband, Ty Murray is involved in PRCA and PBR and is an acclaimed bull rider and bonafide cowboy. Naturally, they would have an adorable little cowboy! Whitney purchased the fabric in the Organic Cotton Interlock Knit weight offered on Spoonflower and it was the softest, sweetest fabric, especially when backed with minky and piped in denim. The finished pieces look so precious and I'm so excited that someone so special gets to enjoy my design. Hopefully sweet little Kase Townes Murray will always love his blanket! The finished products consisted of a bib, blanket and burp cloth. The blanket is so incredibly soft! All three pieces were backed with minky fabric.